Epact: Equinoctial Dial unsigned, late 16th century ? 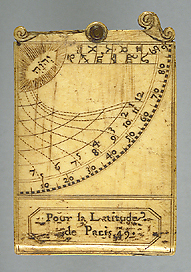 This Regiomontanus-type dial is inscribed on one side as being made for the latitude of Paris, 49?. In the apex of the horary quadrant, on the obverse of the ivory leaf, it has the Hebrew tetragram meaning 'God'. The two terminal scrolls at the top of the leaf are pierced to form sights.